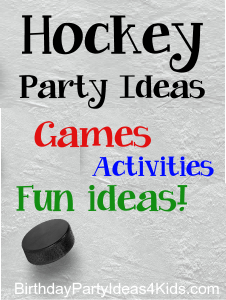 Invitations can be fun - cut out an glue a hockey puck to a card with party information inside..
Buy mini hockey sticks and print the party information on them with a permanent marker..
Make a team jersey card. Using cardstock cut a piece of 9.5 x 11 into two pieces each one 9.5 x 5.5. Fold over and trace a jersey pattern onto the card. Cut out the jersey making sure to leave the neck attached. Cut and paste a picture of your favorite hockey teams logo on the front and write party information inside.. 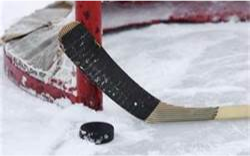 Ask everyone to wear their favorite team jersey and bring a hockey stick if you will be playing a game of street hockey. Decorate the party area in your favorite hockey team colors. Use streamers and balloons with colorful tablecloths. Set hockey pucks and sticks around the room along with hockey posters on the walls. Make a penalty box out of a large box and have guests leave their presents inside it. When it is time to open presents have the birthday child sit in the box and one by one let the guests bring up their present to sit in the penalty box while the present is opened. Purchase jerseys in two different colors and iron on letters to spell the guests last names. Use these while they play hockey - then let them take the hockey jersey's home as a party favor. Let them have an autograph session and autograph each others shirts with a permanent marker. Or print out their favorite hockey teams logo and let them trace it onto their jersey. You can find hockey team logos. Take a team picture for everyone to take home (or send out with the thank-you cards) and after they have played blackout a few teeth on the guests, mess up their hair and uniforms and take an "after" picture for fun. Attend a hockey game. Check to see about special birthday party rates and information. On the invitation ask the guests to bring their roller blades and street hockey sticks to the party. Set up goals and mark the hockey game area with chalk. If possible ask a few of the local high school hockey players to come and make an appearance at the party and teach the guests a few new moves. Divide guests into two teams to play or have them play against the parents/adults at the party. Paint wooden frames before the party begins in your favorite teams colors. During the party let guests decorate the frames with wooden hockey sticks, letters, pucks, etc. Most accurate - who can hit a street hockey ball into a bucket from 20, 30, and 40 feet away. Best blindfolded - blindfold guests and see who can hit the ball into the goal. Best Goalie - see who can fend off the most attempts to make a goal (10 shots). Give prizes for the winners. Set up an obstacle course that the guests will have to maneuver a street hockey ball through with their hockey stick. Set up cones and have them criss cross in between them, go around a tire, under several ropes set up 3.5 feet high ... and anything else you can think of that an obstacle course would have. Give the guests whistles and stopwatches to time individuals. These can also be played relay style with teams. When they are done - make them do it again only backwards! Concession foods: hotdogs in foil, popcorn, nachos etc.